With all of my recent TV recommendations you’d think I only watch the BBC! Although this is far from the truth they have put out another brilliant shows that you really don’t want to miss. This is ‘Informer’. The story revolves around a young man named Raza who is essentially blackmailed into becoming an informant to the police. The issue is, he doesn’t know about anything to inform on. As he gets pushed deeper into finding out about crime gangs and terrorist groups each day gets riskier but he has no way out. 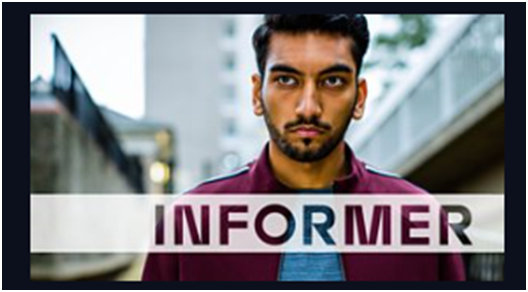 The story told in ‘Informer’ is set up brilliantly. At the beginning of each episode in the 6 part series we get a glimpse into a situation we want to know more about. We find out there has been a terrorist incident in London and we see some key characters in the show giving their statements in the trial. But it really isn’t until the last 20 minutes of the last episode that we find out what really happened and who is responsible. Despite all the clues and theorising, I did not see it coming. I don’t really think anyone else did. And that’s one of the things I loved. But whilst I loved it, I hated it too. The ending, although brilliant, was saddening to my soul. The characters we’ve been following have experienced so much in the months this covers that their lives and to some extent who they are has become so different. It’s painful to see. Informer also shows a harsh reality of racism and prejudices. It seems that Raza wouldn’t have been put in this situation if it weren’t for his age, skin colour or faith. There are some poignant moments in the first episode where he really confronts this and I love how it’s done. I urge everyone to watch this, even if just to see the sometimes shocking reality of what goes on and how people are treated. You can watch all episodes on BBC iPlayer now.